As a parent, I long ago decided that I would participate in that time-honored ritual of reading to my children at bedtime. We started out, naturally enough, with various Dr. Seuss books and eventually found our way to My Little Pony stories and some (atrociously written) young reader Sailor Moon novelizations. The Junie B. Jones series, as well as Beverly Cleary's various books (which still hold up well, although Ramona the Pest isn't quite so uproariously funny in comparison to Junie B. Jones, a character obviously inspired by Ramona Quimby) have also gained quite a following in the Blaschke household. That's not to say my influence is negligible. Genre-leaning books have included Tolkien's The Hobbit, L'Engle's A Wrinkle in Time and Rowling's Harry Potter and the Sorcerer's Stone. 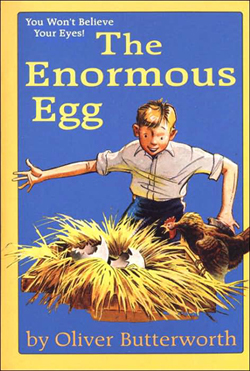 Two books in particular I remembered fondly from my childhood were Oliver Butterworth's The Enormous Egg and Danile Pinkwater's The Hoboken Chicken Emergency. I made a point to track down copies of these books to read to my daughters, and The Enormous Egg was the first one I happened across. Simply put, it's amazing the stuff that's in "children's books" that you never pick up on as a kid. The Senator raised his big hand over his head, and waggled a finger at the other Senators, the way Miss Watkins does when she's getting ready to scold us in class. "The animal I speak of is a dinosaur, gentlemen, of the type known as the Tyranno--ah, rather, I should say the Triplo--no, that's not it... The scientific name escapes me at the moment, gentlemen, but it makes no difference what we call it; it is still the ugliest, evilest-looking reptilian I have ever seen, and it's a disgrace to our National Zoological Park and to the department that operates it. Can you imagine for one moment bringing the innocent, bright-eyed children of good American families to look at this inefficient, outmoded and outlandish specimen of a bygone age? Do we want our children to grow up to be forward-looking citizens of our forward-looking country? Then we must not let them dwell on the useless creatures of the past, the foolish mistakes of Nature discarded long before Columbus planted the American flag on our beautiful shores. No, gentlemen, there must be no living in the past for us, but rather we must bravely face the future, and march on together, hand in hand and shoulder to shoulder, to that glorious destiny that lies before us." Some of the Senators clapped, and Senator Granderson took a few swallows of water from a glass on the table. "I propose to get rid of this monster," Senator Granderson went on. "I am submitting a bill before the Senate to make the possession of all such unnatural animals a Federal offense. It should be exterminated, and the sooner the better." Another man near Senator Granderson stood up. "I agree with the honorable Senator, and I want to propose an amendment to his bill. I propose that this dinosaur be skinned and stuffed, and presented to Senator Granderson as a trophy in recognition of his untiring work in searching out waste and error in the National Government." Naturally enough, the dinosaur taxidermy would be paid for at the public's expense. Certain grandstanding politicians today could well see this book as an attack on them personally, were it not for the fact that it was originally published in 1956. Yet the brilliance of Butterworth's writing is that it can be read as an allegory for pretty much any issue in which the government is dictating social standards from the top down. I don't have to list them here--I'm certain anyone reading can come up with half a dozen without breaking a sweat. As I'm reading this to my girls, I keep thinking how it would make a fun children's movie--especially in light of the resurgence of live-action book adaptations of late, such as Bridge to Terabithia and How to Eat Fried Worms. To my surprise, it has apparently already been filmed as a 60 minute TV movie from 1968. The special effects sound like they make Land of the Lost look cutting edge, and I have a difficult time seeing any of the political commentary from the book making it to the screen considering the time period. But I think the time is right for Hollywood to revisit the material, and it could be great fun. In any event, it's amazing what fun treasures you can find hidden in the pages of half-forgotten books from childhood. This is one of my favorite books of my childhood -- may have been what started me interested in paleontology as a special interest. The illustrations are great too -- I keep remembering Nate riding the triceratops through the hallways of the Smithsonian! All Flesh is Grass. Print, too.